Since my independent discovery of SN1989B in the spiral galaxy, M66 in the constellation Leo back on February 11, 1989, I have always been fascinated with observing galaxies and galaxy clusters. 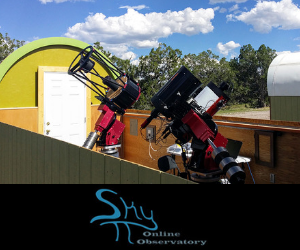 Over this past weekend, Muir and I wanted to try to capture a few galaxy clusters in the spring sky using the remote robotic T-5 (Takahashi Epsilon 250mm) telescope in New Mexico Skies. Over the weekend we referenced the Stellarium astronomy program to find a field of view that may catch multiple galaxies in a single image. One group of galaxies that caught our attention in Stellarium was in the constellation of Coma Berenices. We chose one galaxy in the group that would make a good "center point" for the image. That object was NGC 4872. We scheduled a 300-second exposure at 2:45 am MDT when the galaxy was near transit. After examining the data we received post-processing, we noticed a few different galaxies in the frame. 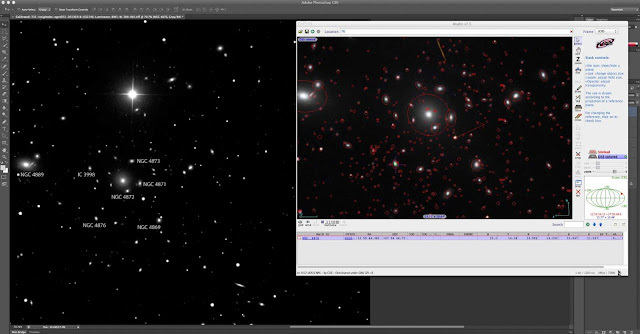 Using the Aladin Sky Atlas astronomy software, I loaded up the DSS color image of NGC 4872. 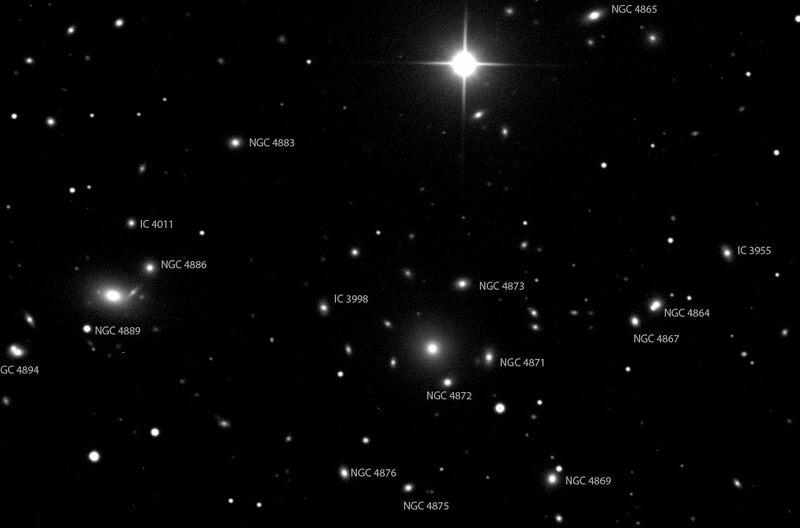 As I zoomed into the Aladin image with NGC 4872 at center, I observed numerous galaxies. Referring back to our image taken with the T-5, what I thought were faint stars were actually galaxies. After the excitement set in, I decided to use telescope T-11 (Planewave 20" CDK Astrograph) the next day to get a magnified image of the galaxy cluster. After waking up this morning around 5:00 am EDT (3:00 am MDT), I jumped on T-11 and acquired the image above. After processing the image, I magnified and saw the same detail in all of the galaxies I observed in the Aladin Sky Atlas software. There were so many galaxies in the field of view that I could not keep count. I then thought it would be a fun exercise to identify a few of the brighter and more interesting looking galaxies using the SIMBAD Astronomical Database overlay in the Aladin Sky Atlas. I was able to successfully identify the galaxies in the image above using the technique pictured left. 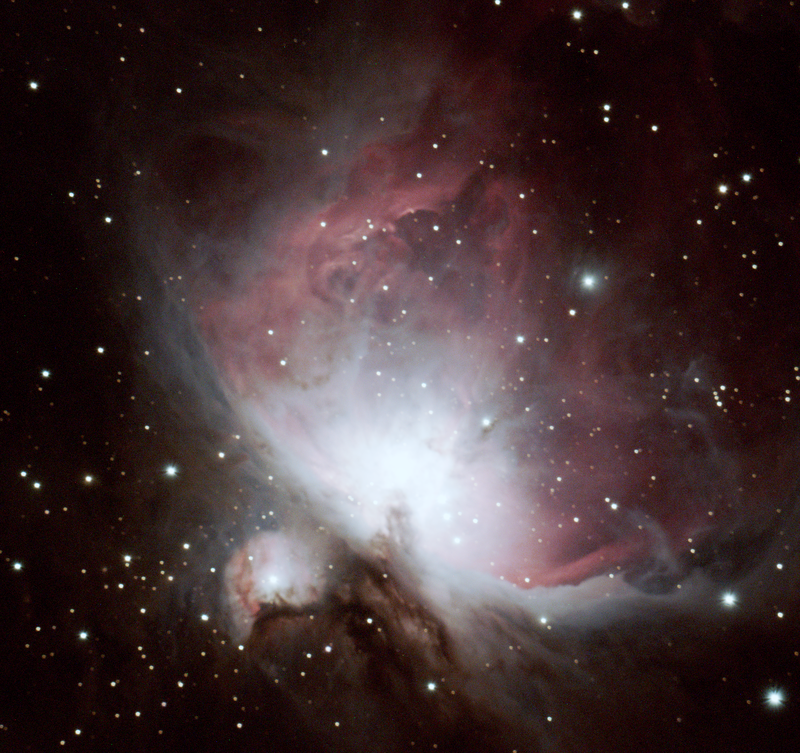 Mount Lemmon SkyCenter using the 0.8m Schulman Telescope. 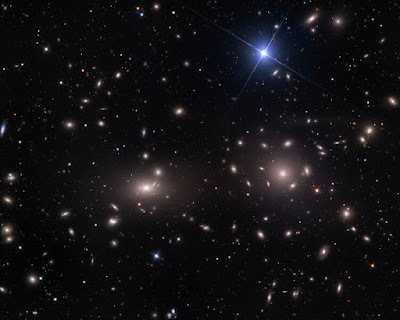 The Coma Cluster (Abell 1656) is a large cluster of galaxies that contains over 1,000 identified galaxies. Along with the Leo Cluster (Abell 1367), it is one of the two major clusters comprising the Coma Supercluster. It is located in and takes its name from the constellation Coma Berenices. The cluster's mean distance from Earth is 321 million light years. Its ten brightest spiral galaxies have apparent magnitudes of 12–14 that are observable with amateur telescopes larger than 20 cm. The central region is dominated by two giant elliptical galaxies: NGC 4874 and NGC 4889. The cluster is within a few degrees of the north galactic pole on the sky. 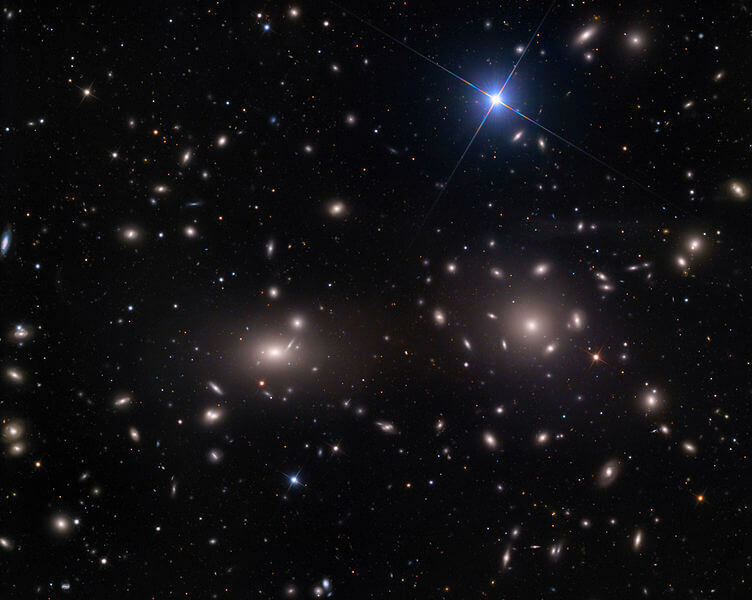 Most of the galaxies that inhabit the central portion of the Coma Cluster are ellipticals. Both dwarf and giant ellipticals are found in abundance in the Coma Cluster. The image (right) shows some of the same galaxies that are in the field of view of the image (top of post) I obtained using the Planewave 20" telescope this morning.